There's no way of covering every last aspect of the Wavedrum's abilities in a review like this - pages could be written without really being able to convey its organic feel. You'll have to sit with the manual to get the most from it but this level of engagement is what the Wavedrum deserves. Invest some time in it and it'll pay you back over and over. Organic, tactile feel. Captivating, other-worldly tone. All-in-all, phenomenally good. It's not very easy to tweak. No MIDI. Those with long memories will remember the introduction of the original Korg Wavestation in the mid-'90s. It was only a decade-and-a- half ago, but that's a lifetime in electronic music terms, so it's a good thing indeed that the brand has revisited what was revered as one of the most inspiring, odd, playable electro percussion toys in musical history. The new Wavedrum might be significantly more affordable than the first version (which retailed for £1500-odd when released), but it arguably looks better. Out is the, erm, toilet-seat aesthetic of the original and in is a 'futuristic conga' look. "It's hard to describe this second generation Wavedrum's breathtaking sound and playability. It's phenomenally good"
It's still a hefty enough piece of kit and, at just over 13" in diameter, it's perfectly sized for hand or stick playing. The chassis of the Wavedrum might be plastic, but it inspires confidence in terms of longevity, and the steel 'hoop' and tactile head are instantly inviting. The fact that the Wavedrum feels more like a real instrument than an electronic gadget will become something of a theme in this review - and the fact that the head is tensionable (with five bolts) is just one of the factors that plays a key part in this. The rounded profile of the hoop, and its satin finish, are clearly designed for comfort, but there's extra functionality built in here too. Two notched ridges (wide spaced on the right of the hoop and closer on the left) are present to allow for additional sonic options. Scraping a stick or flicking across these ridges with a fingernail gives a completely different response than playing on the head in 'standard' fashion. The playing area rightly dominates the unit, with controls - limited to a volume control, six buttons, three LEDs and a 'Value' pot - taking up a narrow strip at the top of the drum. Connections to and from the Wavedrum are similarly simple. Two 1/4" jacks for left and right stereo output, a headphone out and Aux In (the latter two both on mini-jacks) and that's your lot. Yep, there's no MIDI - more of which later. Internally, things are a lot more complex, however. The Wavedrum's DSP innards combine analogue, additive, non-linear and physical modelling synthesis methods to deliver 36 sound-shaping algorithms. And these basic building blocks appear alongside 200 different PCM instruments that cover some extremely convincing acoustic percussion emulations. If all of that means next to nothing then read on, because it simply means good things are contained within. Before delving into the gloriousness of the Wavedrum's sonic arsenal, it should be pointed out that just as it's a flexible musical performer, it's also versatile from a playing perspective. The unit can be mounted on any standard snare drum stand for inclusion in a kit, mounted on a taller stand for playing at conga height, or nestled into your lap for sat-down hippy jamathons around a camp fire. Near an electrical outlet, clearly. Once set-up, you can start digging in, with hands, sticks, mallets or whatever you prefer. Either way, you're going to be spoiled. 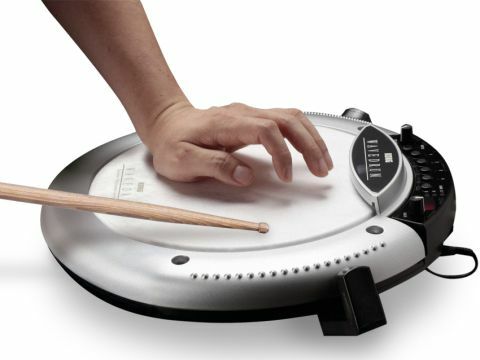 We've already alluded to the fact that the Wavedrum feels like a real instrument. On the most basic level that's because its recreations of congas, djembes, snares and myriad other acoustic instruments are so impressive. The emulations are complex and deep, responsive to every playing nuance; as such the Wavedrum avoids any sensation of just being a clever trigger. Instead it feels organic, alive and, yup, very real. If you were just to use the Wavedrum as a source of acoustic percussion sounds you'll never tire of it. But the real fun starts when you harness its wilder side. Within the 100 preset programs are gems like Yoga Breathing Drum, a deep tabla tone with a 'talking' pitch bend when you press the head and Japanese taiko and tsuzumi drum sounds triggered from the rim. It's hard to describe this second generation Wavedrum's breathtaking sound and playability. It's phenomenally good. But there will be those that raise an eyebrow at what is an unarguably clunky, arcane editing system that involves multiple button pushes (and remembering that 'U.Cr' and 'P.tn' are the three-segment LED's way of announcing the Velocity Curve and Pressure Tune parameters), and a lack of MIDI. Frankly, it's oddness like this that adds to the Wavedrum's character, though - you have to learn to work with it and around its quirks. And no MIDI? Well, the resulting standalone nature only further reinforces the idea of the Wavedrum as instrument, not studio trigger machine.